This is a very common concern, as babies tend to know what feels comfortable and don’t care about doing things the way the books tell them! Photos of stretchy wraps tend to show baby’s face turned to the side for a more appealing image and also for people to be able to simply demonstrate that airway is clear for educational or safety purposes. 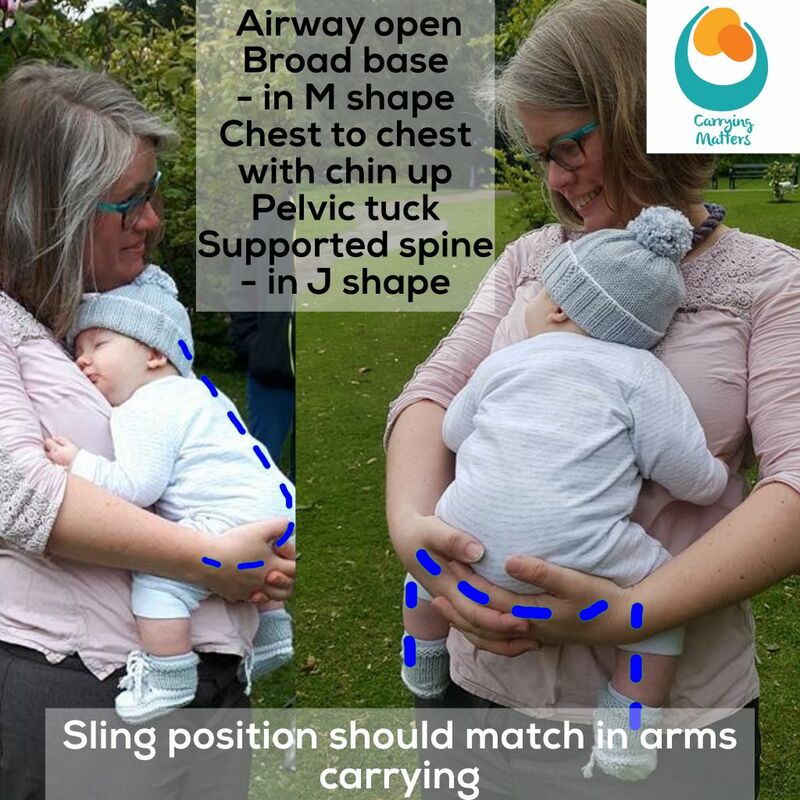 Many young babies do indeed like to snuggle into their parent’s chest when held on the front, and as there is always so much emphasis on ensuring a clear airway, it can be worrying, especially if baby resists gentle head turning or just “face-plants” again immediately. Don’t worry; the human nose is shaped to ensure airflow can continue even when babies do this. Try it yourself, place the flat of your hand against your nose and press gently. You can still breathe, and so can your baby, against a flat surface. This is why it is so important to have babies held close enough to kiss, with faces on the upper flat part of the chest, not buried in cleavage (or in lots of loose fabric such as oversized snowsuits or scarves). 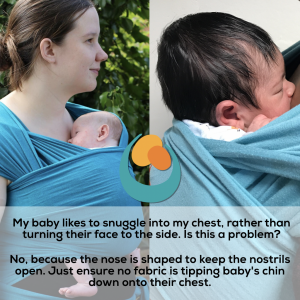 You can flip the shoulders of your wrap out onto your shoulders to ensure good airflow on either side (see here for how to do it) of your baby’s face. When baby is settled, see if you can gently turn their face to the side just a little, as in the image below. Here is another image from a different angle showing the gap that the nostril provides for breathing. 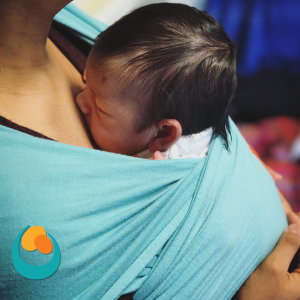 Fabric should never come up the back of baby’s head when their face is resting on your chest, as this can tilt their chin down onto their chest and cause an airway compromise. 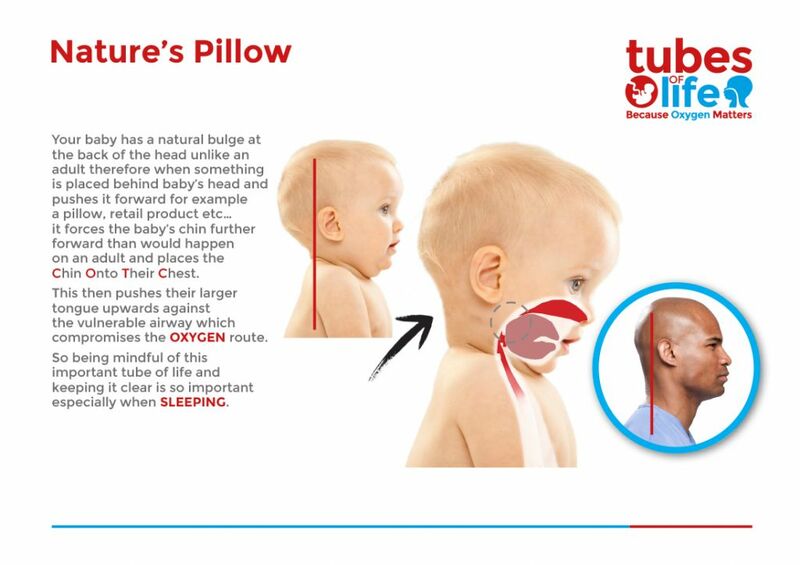 This is because babies’ occiput (the round part of the skull at the back) is more prominent than in adults and any pressure here will bend their head over and press their chin to their chests, affecting the shape of their airways. The most important thing is to ensure baby is well supported up to the nape of their neck and in a good chest-to-chest position that respects their natural spine curve and avoids slumping. This image from Tubes of Life shows the issue well.